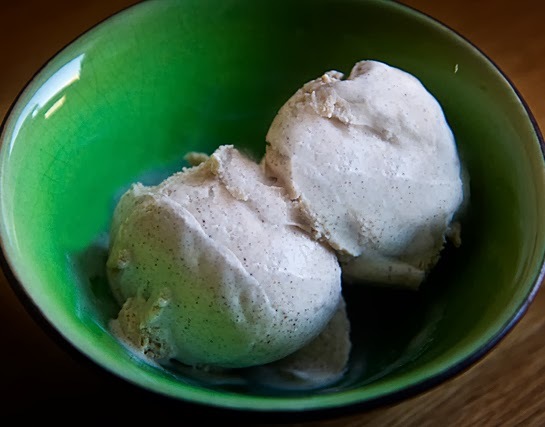 I’d intended to post this cinnamon ice cream recipe last week, but I got wacked with the flu and almost missed Thanksgiving, so blogging was the last thing on my mind. I managed to deliver a traditional American Thanksgiving dinner to my British family, but had to nix the soup course and delegate dessert to Robert because I just didn’t have the energy to bake homemade pie. Luckily I’d made the ice cream in advance, and Robert came through with a delicious apple crumble, which went perfectly with this homemade cinnamon ice cream! Whisk together the sugar and coffee cream over medium-low heat, and slowly bring it to a simmer. As it starts to simmer, remove it from the heat. Add the mixture back to the pot and whisk in the heavy cream. Continue to cook it over medium-low heat, stirring with a metal spoon until it thickens enough to coat the back of the spoon. Remove it from the heat, whisk in the vanilla and the cinnamon, and let it cool, then process it in your ice cream maker for 45 minutes to an hour. *This is half and half in the States… you’re looking for something with around 10% fat. I made this for Thanksgivng this year and it was delicious!! I think we may have a new food tradition, thank you so much for the recipe!